Wood specimens of Beech (Fagus silvatica L.) and Scots pine (Pinus sylvestris L.) modified by a hydrothermal treatment process were analysed by means of Fourier transform infra red spectroscopy (FTIR). The chemical transformation of the cell-wall material was studied and associated with improved wood qualities. For this purpose, FTIR spectroscopy was used as since this technique has been found appropriate to determine the intensity of specific bonds and functional groups within the polymeric structure. Cleavage of acetyl groups of the hemicellulose has been found to occur in the first treatment step under moist conditions and elevated temperature. This results in the formation of carbonic acids, mainly acetic acid. Most of the acetyl groups were found to be cleaved during the treatment of wood at high temperature, whereas only partial deacetylation was found to occur at moderate treatment temperature. The concentration of accessible hydroxyl groups was measured by acetylation and found reduced after treating at high temperature. Esterification reactions were found to occur under dry conditions at elevated temperature in the curing step, indicated by the increase of the specific ester carbonyl peak at 1740 cm−1 in the FTIR spectrum. The esters that were formed turned out to be mainly linked to the lignin complex, considering that the newly formed carbonyl groups were found present in heat-treated wood, yet were found to be absent in the isolated holocellulose. 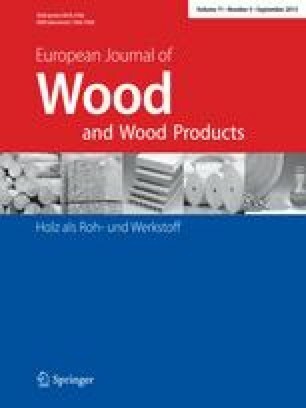 Esterification contributes to a decrease of hygroscopicity of wood and consequently improvements of its dimensional stability and durability. However, the role of esterification in the decrease of hygroscopicity in the hydrothermal treatment process examined is believed to be minor compared to the influence of cross-linking reactions known to occur during thermal treatment of wood. Das Holz hydrothermisch modifizierten Buchen- und Kiefernholzes wurde mit FTIR Spektroskopie untersucht. Die chemischen Veränderungen wurden mit dem Hintergrund veränderter Holzeigenschaften diskutiert. Abspaltungen von Acetylgruppen der Hemicellulosen finden vor allem bereits im ersten Prozessschritt unter feuchten Bedingungen und bei erhöhten Temperaturen statt. Dieses führt zur Bildung von Essigsäure und anderen Carbonsäuren. Bei niedrigeren Temperaturen werden weniger Carbonsäuren freigesetzt. Durch Acetylierung wurde der Gehalt an freien Hydroxylgruppen bestimmt. Durch die Hitzebehandlung reduziert sich der Gehalt freier Hydroyxlgruppen. Die Zunahme des Carbonylesterpeaks bei 1740 cm−1 im FTIR Spektrum lässt sich durch Veresterungsreaktionen im heißen aber trocknen Curingschritt erklären. Diese Ester sind vor allem an den Ligninkomplex gebunden und weniger an die Holocellulose. Durch Veresterungen wird ein hygroskopisches, dimensionsstabiles und dauerhaftes Material geschaffen. Die Veränderung der Materialeigenschaften beruht jedoch vor allem auch auf cross-linking Reaktionen die während des Prozesses ablaufen. The authors would like to thank Karel van der Heijden, Clarine Sieger and Bas Holleboom for their experimental assistance.